Tanaka still scheduled to go on trial in March. 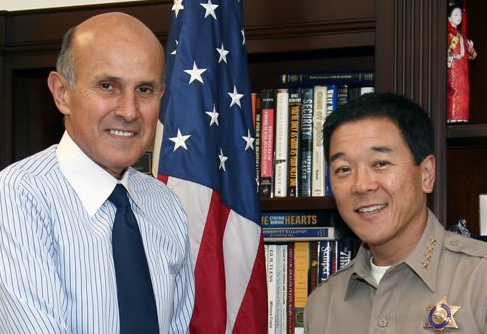 In 2011, Sheriff Lee Baca appointed Paul Tanaka as undersheriff. Former Los Angeles County Sheriff Lee Baca has agreed to plead guilty to a felony charge of making a false statement to federal authorities who were conducting a wide-ranging corruption and civil rights investigation into the Sheriff’s Department. In a plea agreement filed Feb. 10 in U.S. District Court, Baca admitted that he lied to the FBI and the U.S. Attorney’s Office when he falsely stated that he did not know that LASD officials were going to approach the FBI’s lead agent on the investigation in 2011. In fact, Baca was aware that his deputies were going to contact the agent, and he directed that they “should do everything but put handcuffs” on her, according to his plea agreement. During an April 12, 2013 meeting with FBI agents and assistant U.S. attorneys, Baca falsely stated that he was not made aware of his deputies contacting the FBI case agent until he received a phone call from the FBI’s then-assistant director in charge of the Los Angeles Field Office, who told Baca that deputies had threatened to arrest the agent. In the plea agreement, Baca admitted that he knew his statement was untrue and that it was illegal to lie to federal investigators. The threat to arrest the FBI case agent was part of an extensive scheme to obstruct justice that previously has resulted in eight LASD deputies with ranks as high as captain being convicted of federal charges. The ninth person to be charged in relation to conspiracy to obstruct justice – former Undersheriff Paul Tanaka – is currently scheduled to go on trial on March 22. During the course of the investigation that was being conducted by the FBI, the U.S. Attorney’s Office and a federal grand jury, a sheriff’s deputy assigned to the Men’s Central Jail accepted a bribe to smuggle a cell phone into the facility. The phone was delivered to an inmate who was working as an FBI informant. Jail officials later discovered the phone, linked it to the FBI and determined that the inmate was an informant. This led to a month-long scheme to obstruct the investigation, which included members of the conspiracy concealing the informant from the FBI, the U.S. Marshals Service and the grand jury. Members of the conspiracy also engaged in witness-tampering and harassing the FBI agent. Tanaka is alleged to have managed a secret plan to hide the informant, Anthony Brown, from his FBI handlers by booking and re-booking him under a series of false names. The eight deputies said that they had been following orders from superiors to investigate the smuggling of the cell phone. City News Service quoted Tanaka’s attorneys, Jerome Haig and H. Dean Steward, as saying that Baca’s plea deal makes the case “all the more interesting,” but that they are still prepared to call Baca as a witness during Tanaka’s trial. Tanaka, who is also the mayor of Gardena, retired from the Sheriff’s Department in 2013 after serving more than 30 years. He ran for sheriff in 2014 but lost to the current sheriff, Jim McDonnell. Baca participated in a Sept. 25, 2011 meeting in which senior members of the department discussed approaching the FBI case agent. The next day, two LASD sergeants approached the agent and threatened her with arrest. During the 2013 meeting with the FBI and assistant U.S. attorneys, Baca denied knowing about the plan to approach the case agent, and he also denied participating in conversations about “keeping the FBI and Inmate AB away from each other,” according to the statement of facts in the plea agreement. In the plea agreement, the parties agree that the federal sentencing guidelines call for a sentence of up to six months in federal prison, and they have agreed that Baca should not receive a sentence above the guideline range. The actual sentence will be determined by the federal judge presiding over the case. But if the court decides to impose a sentence greater than six months, Baca would be allowed to withdraw from the plea agreement and face a possible indictment.